Not that I’m biased or anything, but I have the most wonderful and talented readers in the world! Nothing warms like heart more than when a reader reaches out and let’s me know that they were inspired by one of my projects to create something amazing in their home! 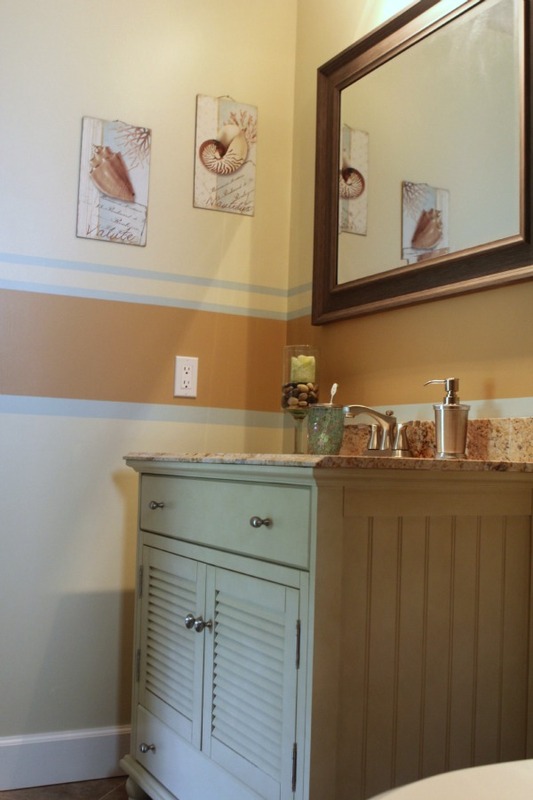 One of my sweet readers, Genna Lunsford from Florida, said she was inpired by my Painting Stripes Made Easy tutorial and is sharing her beautiful coastal bathroom makeover with us today. The striped walls really brought it all together. The tricky part was that I wanted my colors to be opposite. 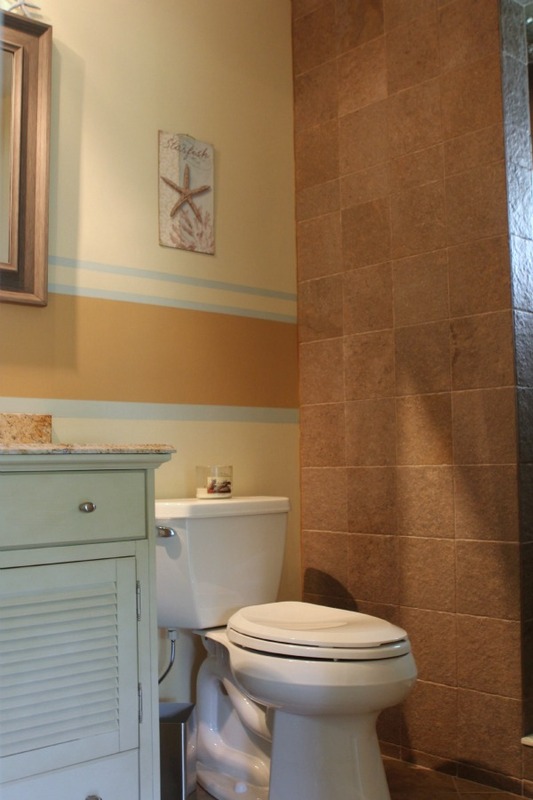 With all the dark tile and small space i wanted the main part of the walls to be the lighter color (almond paste). First i measured how high the vanity and backsplash were. Then i marked notches with a pencil so i knew where my bottom line would end. I then painted an 18″ section of the blue accent and let that dry a few hours. I then had to remark the bottom 38.25 inches from the floor. Using the level i marked off a guide line every 6 inches so that i knew where the bottom of my bottom line would be. I decided to make the bottom blue stripe twice as thick as the top blue stripe and the same thickness as the almond paste stripe. I definitely recommend using the Edge Lock painters tape by 3M. It creates magic lines and you don’t have to worry about bleed thru. Didn’t Genna and her hubs do an amazing job?! The bathroom is gorgeous! Thanks so much for sharing it with us! 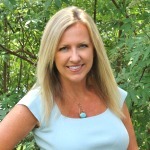 Please give Genna some comment love!!! If you have been inspired by a project I’ve shown then I’d love for you to share it with me! You never know, you just might get featured! What a fabulous redo! 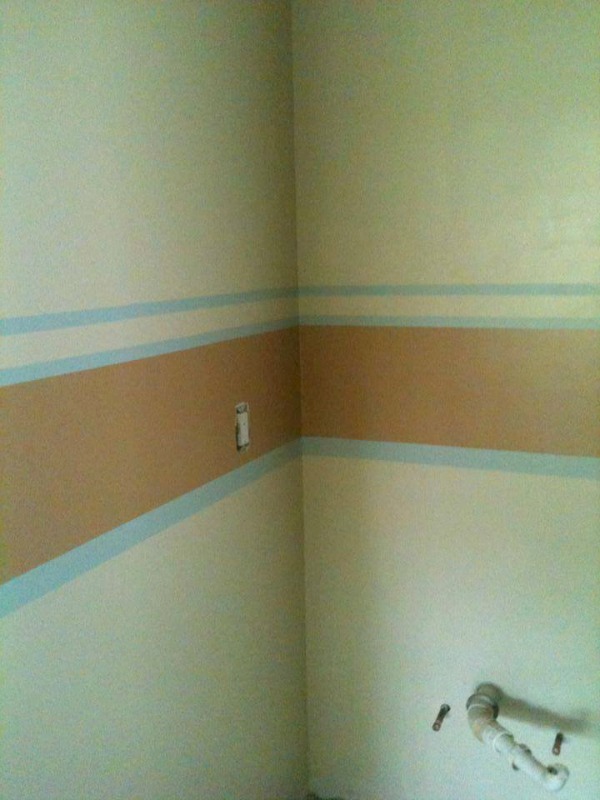 Great color choices and unbelievable job on the stripes! Wow, what a great job. The stripes are all so crisp and defined, will definitely have to try that 3M tape. Thanks for sharing. The stripes are so perfect!! The stripes and the colors she chose are beautiful! 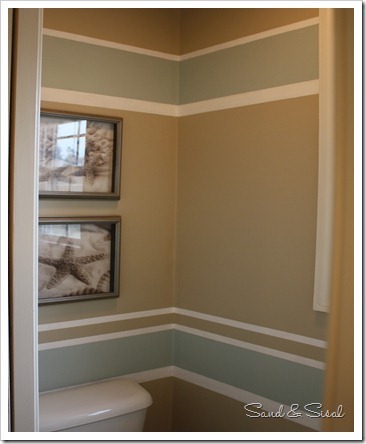 I’ve been playing with the idea of beadboard wainscoting in our bathrooms, but now I want to make stripes! Oooo I so agree! I’m seriously crushing over that beadboard vanity. It is beautiful! Thanks for stopping by KC! The beadboard vanity with the louvered doors was the perfect choice. Would love to see “after” pictures of the floor. I LOVE the stripes! It really makes the room. What a GREAT job y’all did! Looks very professional. 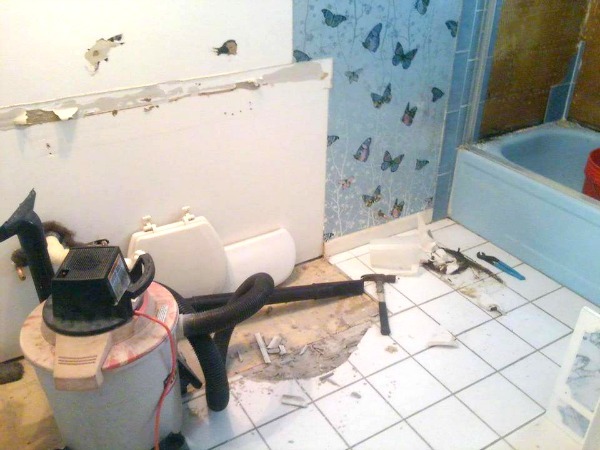 Can’t believe it’s a DIY.